Drift over the spectacular landscape of Anatolia, discover fairy chimneys, surreal valleys and vineyards as you glide into the sunrise on your hot air balloon ride. After your journey through the sky, retreat to the homey atmosphere in one of the cave rooms at the Argos. 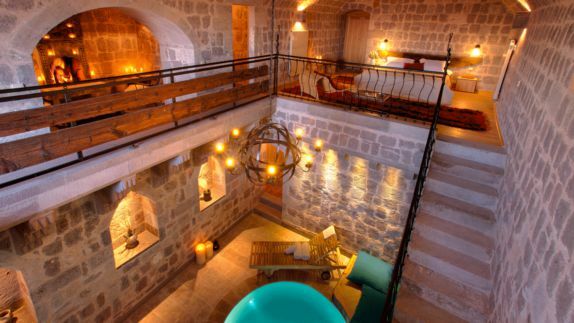 The former monastery was turned into an award-winning boutique hotel with a rich history and nowadays surprises its guests with exquisite service and breathtaking panoramic views of the valley. 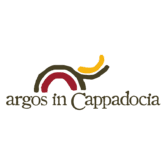 Why is the Argos one of the best places to stay for your trip to Cappadocia? Nestled on the eastern slope of Uchisar and situated on a high plateau in one of the oldest villages in Cappadocia, the multi-level Argos is in the perfect location for breathtaking views of the Pigeon Valley, which is famous for its many pigeon coves carved in the scenic rock formations, attracting visitors from all over the world. The hotel is just a few minutes walk away from the center of Uchisar, where guests can find a variety of traditional restaurants and shops. How is my private space? 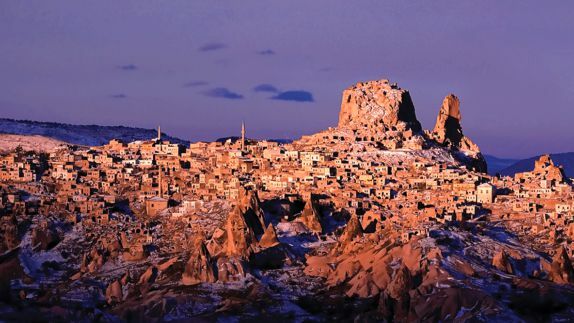 Will I be able to overlook the village of Cappadocia? 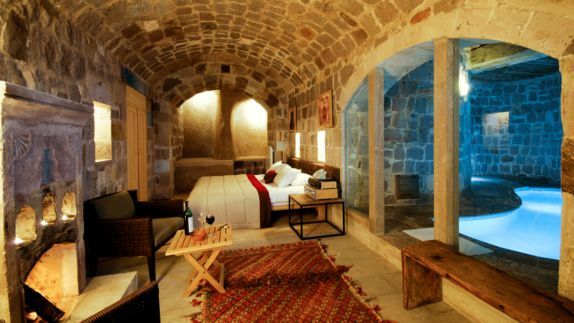 Ancient traditions such as exquisite stone carvings and antique furniture mixed up with modern influences leave the hotel’s guests in awe upon entering their room. This can only be topped by the breathtaking views of the valley. 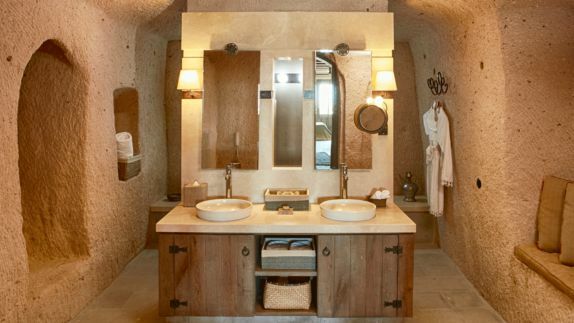 Each suite has a luxurious bathroom and offers an open fireplace. The unique chimney gives the room cozy warmth and makes it the perfect romantic hideout during the winter season. Where can I rest after a long day of Turkish adventures? Get ready for the ultimate spa experience as a new exclusive spa and pool area is currently being built inside the caves. Until the constructions are finalized, guests can retreat to the local Hammam of the village and enjoy an authentic Turkish Bath. How is the cuisine in Turkey? Can I try local specialities in the hotel? Begin your gastronomic journey with a salad of fresh herbs, then continue with the finest beef fillet and a side of local delicacies before finishing off with a traditional oven pumpkin dessert topped with walnut and molasses tahini mousse. After your dinner move to the Seki Lounge and sip on your cocktail by the crackling fire or get some fresh air on the terrace as you enjoy your drink with a breathtaking view. 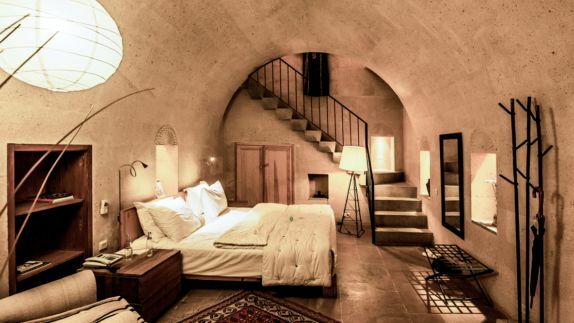 How can I spend my day around Cappadocia? Where can I go? What is awaiting me? 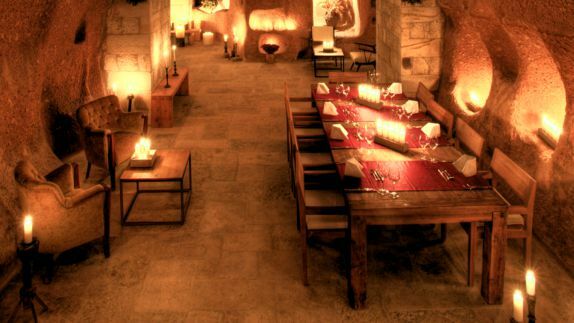 Get ready to be navigated through the underground tunnel system and cellars of the ancient monastery by local guides, recounting almost forgotten legends and histories. Visit the lovely vineyards and discover the finest wines and grapes with all of your senses. After exploring the town and gardens by foot, it is time to change to the bird’s view to take in all of the area’s beauty. On a hot air balloon ride through the Pigeon Valley, you will be able to watch the sunrise and immense beauty of the Cappadocian landscape from 300 meters above the ground – a once in a lifetime experience.